Hair color: Red with purple highlights going down the edges of her hair. 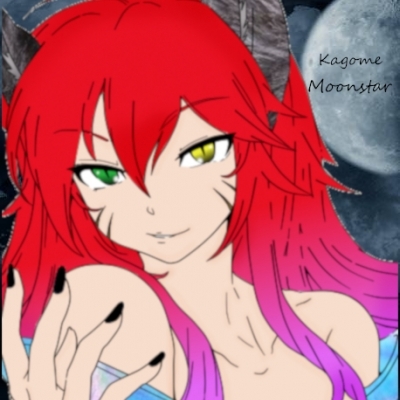 Eye color: As a human Kagome has Green eyes but as a wolfing, she has one eye that's green and another that's yellow. Hobbies: Street performer, Kagome loves to sing and dance for little kids. Story: For 5 years of Kagome's life, she had been locked up in the basement of her abusive father's house punched, kicked, yelled at and cursed at until she turned 6 years and decided that she had enough and out of the basement by escaping through the window and running away as fast as she could, never looking back. 10 years of living on the streets, she learned how to fight, how to steal and even how to hide from people who want to harm her. Favorite singer ? : Nana Mizuki. Least favorite foods and sauces? : Tomatoes, extremely spicy foods, onions, buffalo barbecue sauce, ranch dressing. A. I'm ok, you ? Q. Who's your favorite Vocaloid? A. Miku, because that was the Vocaloid I was first introduced to. Great! What do you like to roleplay? If your not too busy, perhaps we can discuss one now? Good idea :). Do you want to start off doing that? I'd probably be the "bad guy", and i could react to whatever she does :).Do you wanna do the rp here or? Just curious, because i read your character"lore" and i found it interesting. With Jeff (Which is probably the character i'd use, but it depends) the location of the other persons character is really important. Kagome is perfect for it though :). I've yet to rp on this site actually, i usually rp on sites like "Chatzy" or with my friends who have Discord. We could do it on here, just expect me to have a different style initially, though, i'd catch on without trouble :). So is Kagome homeless?